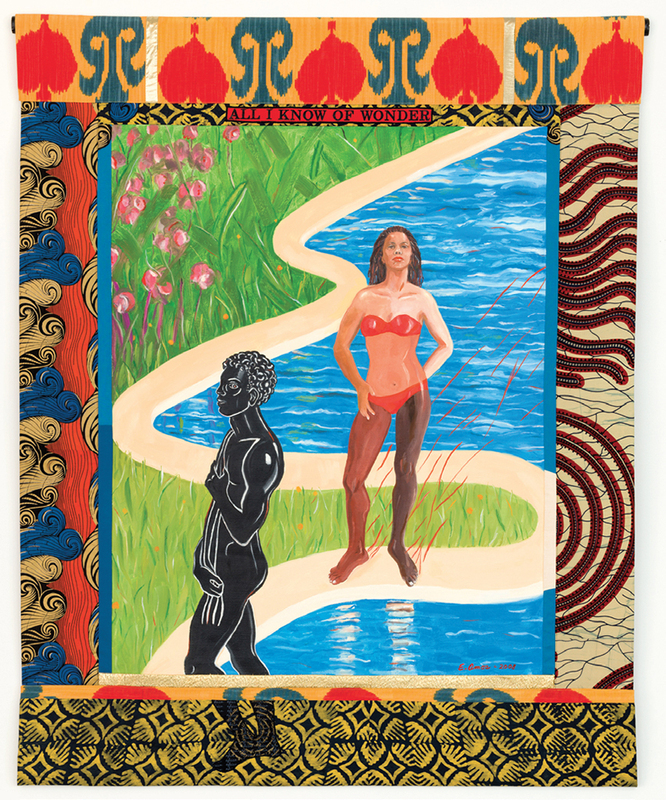 Emma Amos, All I Know of Wonder, 2008, oil on linen, African fabric, 70 1/2 x 55 1/2". © Emma Amos/VAGA, New York. In Tightrope, 1994, Emma Amos paints herself as a circus performer. In star-spangled underwear and a black duster, she tiptoes on a high wire over a woozy crowd of blurred faces and headless eyeballs. In her left hand are two paintbrushes; in her right, she holds a T-shirt emblazoned with a pair of pendant breasts over a platter of red mango blossoms. This fragment of a body belongs to one of the subjects of Paul Gauguin’s Two Tahitian Women, painted during the disaffected Frenchman’s Pacific sojourn in 1899. Amos’s vicious brushstrokes and high-key colors burlesque Gauguin’s colonial primitivism with humor and ferocity, and she disciplines these energies with a border of printed African cloth, studded at each corner with a photo transfer of Gauguin’s painting.